This lovely Christmas Stocking is made with plush red and white fur and is lined on the inside and has a red hanging loop too. 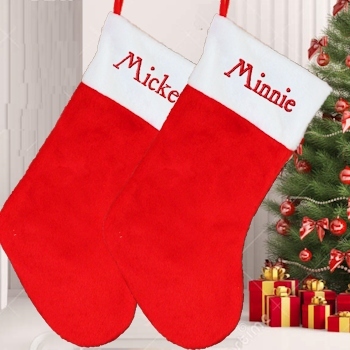 This is a festive 48cm length Christmas stocking that you can have Amys Gifts personalise with a short name or initials beautifully embroidered in red thread making this stocking a special Christmas decoration. The name will be embroidered in your choice of festive Xmas Print. Amys Gifts stockings are made to order and we do our best to get orders dispatched within approx 2 days.